European Labour Mobility Congress is the biggest annual event in Europe dedicated to the posting of workers. 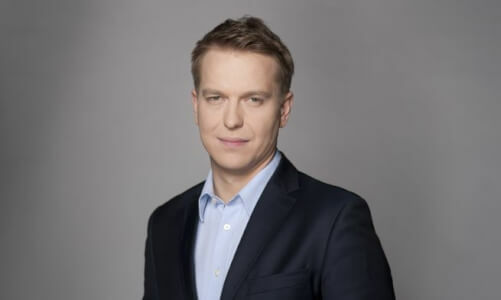 The first day of V ELMC will be moderated by Marek Tejchman - Deputy Editor in Chief at Dziennik Gazeta Prawna Marek Tejchman is one of leading financial journalists in Central and Eastern Europe, specialized in analysing the role of the state in economy. He gained recognition describing rapid changes, which the region has undergone. Previously a television presenter at TVN CNBC. Dziennik Gazeta Prawna is a Partner of V European Labour Mobility Congress. European Labour Mobility Congress prides itself with being the biggest European event dedicated to the posting of workers. Organizer, the Labour Mobility Initiative Association is an NGO which brings together scholars, business and public administration representatives involved in the topics related to the posting of workers and labour mobility. ELMC is a forum of exchange of knowledge on the rules of the posting of workers for all of the stakeholders. It makes possible for the employers, politicans, public administration, lawyers, researchers and trade unions to be jointly present. V ELMC Participants receive specific knowledge on the applicable law, its correct interpretation and current guidelines followed by the institutions responsible for enforcing regulations regarding the posting of workers. During the second day, dedicated to the employers, Participants also receive answers to their questions and solutions to specific problems given, that are not available anywhere else. First day of the Congress is an opportunity to get more knowledge about the direction of works on the new rules of posting workers abroad and coordination of the social security system, the discussions about protection of local labour markets in particular countries, about ‘social dumping’ and if the competition of the Eastern European countries is really unfair. Panelists are top political decision makers and public administration representatives. Co organizer of the first day of V ELMC is Polish Ministry of Economic Development. Posting of workers in the framework of the freedom to provide services in the EU is a rare example of win – win economic solutions, which we all enjoy. It improves competitiveness, creates jobs, bridges the earnings gap between low wage and high wage member states. It prevents drainage of qualified staff from the sending countries, and it prevents debiting the social security systems, social infrastructure and public services of the host countries. As the best legal way of allocation of skills it prevents social dumping or “race to the bottom” caused by undeclared work. Last but not least it allows consumers across Europe to access the services that local companies do not provide. Despite all these obvious advantages, public opinion in the host countries often blames posting of workers for many economic and social problems, like social dumping, local unemployment, lowering social standards or even assassination of a built through the years social model. Let’s explore together with the use of data and in the sincere debate if the posting of workers and freedom to provide services is a source of problems, or a means of mitigation. Let us ask the question can there be such a huge gap between the benefits of posting and its perception. Let’s ask about the first effects of the implementation of the Directive of 2014 and the impact of the proposed changes by the Commission on the freedom to provide services in the EU. The crowning of the first day of the Congress will be a solemn gala with The Labor Mobilis award ceremony. Traditionally, the ceremony consists of unique artistic performance and banquet. This year co organizer is Krakow Festival Office which realizes the most prestigiouse and appreciated by world-wide critics cultural and music events. Szymon Budzyk – Head and Artistic Director of famous Cracow’s theatre “Teatr Odwrócony” is the director of the Gala which will be led by Andrzej Rozmus. Second day is dedicated mainly to the employers who post workers abroad. When it comes about cross-border services knowledge of the recent interpretation of the provisions is necessary. However, lack of law precision makes many complications even with the basic terms. That is why practical workshops are mainly based on examples, anlyse of rules and judical decisions. Agenda of the second day includes practical workshops traditionally led by experts and lawyers practicing labour law and social security law. Every year, one of the most popular is a workshop by Anna Siwiecka, Head of Department in the Central Branch of the Polish Social Insurance Institution (ZUS). Her main are of competence are procedures and rules of issuing the PDA1 by ZUS branches in every part of Poland. Is equal pay for the same work fair when it depends on the place of work? Discriminatory control practices, Moliere clause, Simple declaration charges, Cross-border labour costs, The same work in the same place clauses in the context of replacement and in the context of equal pay. Single national web page. The future of posting workers. Weak enforcement or new provisions? Provisions amendments 2017/2018: who is at risk?